11 GOLDEN RULES OF MILITANT VACCINE PUSHERS — PART 1 | "Global Possibilities"
Global Freedom University is coming. 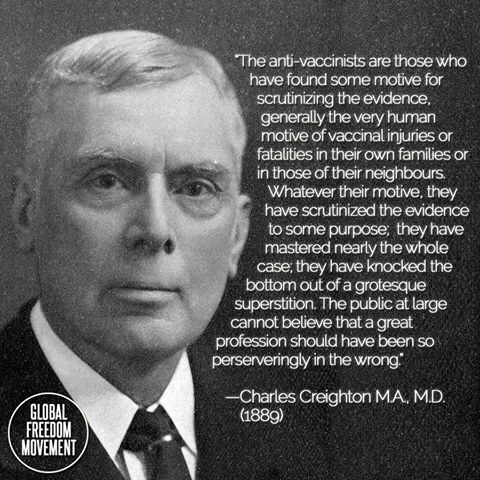 This article (“11 Golden Rules of Vaccine Pushers – Part 1”) is original copyrighted material belonging to Global Freedom Movement and may only be re-posted in FULL, with proper (clickable) attribution, with all hyperlinks, author bio, and this copyright statement intact at top. Act with integrity or act not at all. 1. The “Greater Good” is all that matters a.k.a. the end justifies the means. Ignore the fact that “herd immunity” cannot be attained through mass vaccination and that the idea itself originally emanated from the observation that natural acquisition of a disease strengthens the “immunity” of the “herd” in the long run and protects those at high risk of serious infection through the “herd’s” contact with the pathogen and resultant long-term immunity – which vaccines attempt to mimic but do not provide. Ignore the fact that in the developed world measles mortality had fallen by as much as 99.6% before measles vaccines were introduced, while some other diseases, such as scarlet fever and tuberculosis in the USA, virtually vanished (certainly the mortality rates became vanishingly small) with no vaccine being adopted for them at all. The extreme nature of current vaccine ideology has led to the Biosecurity Act 2015 and other similar totalitarian pieces of legislation (See: GHSA) leading us to collective mandatory vaccination REGARDLESS of evidence of highly elevated risk for certain individuals and the evidence of intrinsic harmfulness of every single dose. Policies of mandatory vaccination are policies of physical invasion and violence, and can only succeed if the psychological brutalisation of society softens the public to the next uptick in tyrannical governmental operation. 1(a). Censorship of all well-founded contrarian viewpoints. 2. Create (and maintain) a biased false narrative as context for all vaccine discussion to occur within. Tolerate no deviation from your arbitrarily set boundaries. 2(a). Lie, lie again, and if that fails lie some more. Maintain the false narrative. 2(c). Blame 100% of “anti-vaccine” sentiment on earth on one man: Andrew Wakefield. 2(d). Blame virtually all disease contracted by anyone anywhere on the unvaccinated population. 2(e). Manipulate (and also use bizarre) statistics to enhance apparent vaccine value and downplay harm. 2(f). Bizarre statistics to sell more vaccines: combining flu deaths with pneumonia. 3. Use guilt and shame as techniques for emotional manipulation to foster acquiescence and subservience. Above: One of the most dangerously misleading ads you are ever likely to see. Learn about the shocking carnage caused by HPV vaccines here. PS: Cannabis oil is being used to reverse cancer everywhere – even “incurable” liver cancer. 4. Maintain blanket amnesia and ignore history.